Prototype: 4 different German State Railroad Company (DRG) express train passenger cars to make up the train composition for the express train D 119 in 1931. 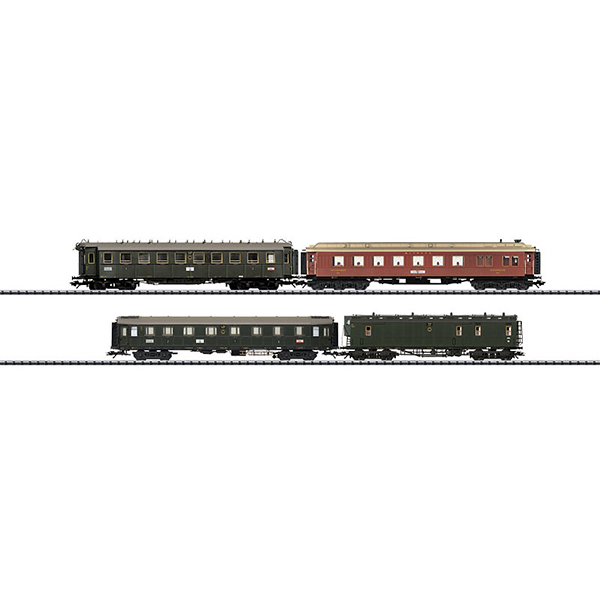 1 type Post4 mail car, 1 type AB4ü-23a coach, 1st/2nd class, 1 type WR6ü dining car, and 1 type C4ü Bay 08 coach, 3rd class. Model: Era II. The cars are highly detailed. They have factory-installed interior lighting. The cars have NEM coupler pockets with close coupler guide mechanisms. Total length over the buffers 885 mm / 34-7/8. This set goes very well with the class 18.3 express locomotive with a tender (item nos. 22180 and 22181). An add-on set with 2 additional express train passenger cars to go with this set is available under item no. 23395. The Marklin add-on set, item no. 42763 (does not come with factory-installed interior lighting), can also be used to lengthen the train to make up a prototypical 8 car composition.